I'm more of a jeans or shorts girl, but if you're into skirts for summer, check out these sewing tutorials. Here are options for little girls and ladies. Thanks for the this post. I'm going to buy some fabric and ask my mom to sew me some since my sewing skills are limited! Ohh, fabulous! Thank you thank you! thanks for featuring my skirts, jess! so honored. Oh, these are awesome! I'm so going to have to make some skirts now for summer. Love all your great ideas. Thanks for stopping by my blog. This is great (I love the full Skirt)! I wish I had any skill whatsoever when it came to sewing. Oh well... it's still fun to look! oo I always wanted to make a full skirt! Thanks for the collection of awesome tutorials! These are all so cute! I've been wanting to make myself a maxi-skirt for awhile now, so I'm feeling very inspired! 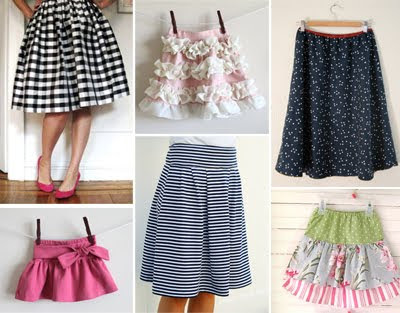 With a burgeoning belly this summer, I am all about skirts! These are really cute, and I can even see me trying my hand at making some for my 3 year old. Once again, thanks for the links! I love it so much, but alas, I have no sewing machine.. and they intimidate me..
love the blog but don't comment often ... I have a LONG summer ahead of me with all of our friends away and us staying put in Delhi ... so this is WONDERFUL! I've just decided, I'm going to Sew the Summer AWAY! So many choices for the holiday weekend. Thanks for posting! These are great skirts! I love how made it as lovely and colorful. Thanks for the tutorial by the way! I love Gertie's tutorial and have made 3 skirts from it already...plan to make more!